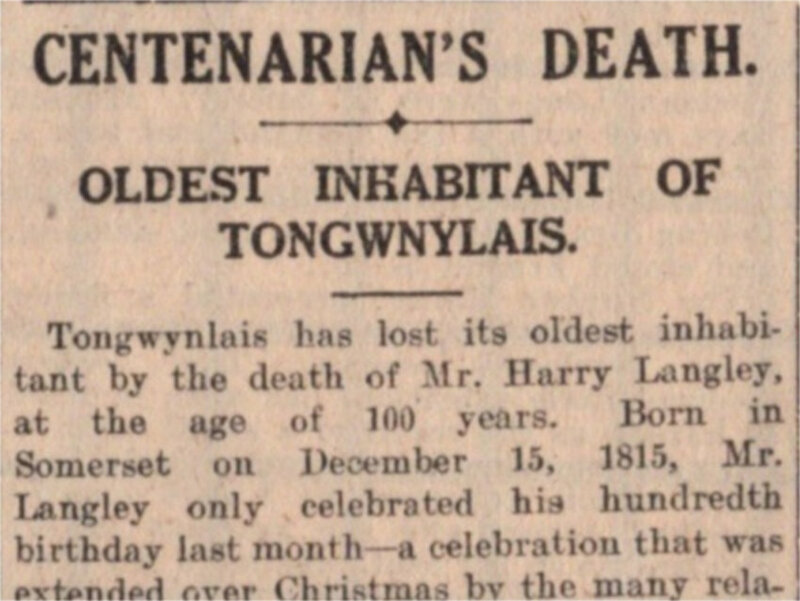 This week I’ve discovered a Western Mail report from January 1916 on the death of Mr Harry Langley from Tongwynlais, who died at the age of 100. The reporter visited Mr Langley on Christmas Eve in 1915, just a few days after his 100th birthday. Mr Langley is described in the article as a “fine old man” who “looked good for a few more years, and was quite rational and cheerful in his conversation.” The full text is below. 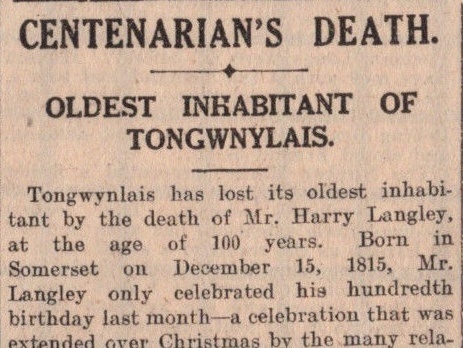 Tongwynlais has lost its oldest inhabitant by the death of Mr. Harry Langley, at the age of 100 years. Born in Somerset on December 15, 1815, Mr. Langley only celebrated his hundredth birthday last month – a celebration that was extended over Christmas by the many relatives who called to congratulate the head of their family upon his remarkable achievement. When a Western Mail reporter called on Mr. Langley on Christmas Eve, the fine old man looked good for a few more years, and was quite rational and cheerful in his conversation. Possibly, the excitement occasioned by the record he set up had some influence in hastening an end that might otherwise have been prolonged. Mr. Langley came as a young married man to South Wales at the time of the construction of the Newport Tunnel on the Great Western Railway, and when that task was completed he found other employment in and around Cardiff. He was eight years in Cardiff before he found work at Mr. Booker’s ironworks at Tongwynlais, better known as “the forge.” Then for a time he was engaged as a watchman on the Cardiff Tramways while the lines were being laid. Up to five years ago Mr. Langley worked at Greenmeadow for Colonel Henry Lewis, that is, up to the age of 95. A hearty figure of the John Bull type up to only four years ago, Mr. Langley spent the greater part of his latter days at the warm fireside of his little cottage overlooking the Glamorganshire Canal on the hillside, discernible from the neighbouring halt on the Cardiff Railway. Mr. Langley was better known in his own neighbourhood as “Harry Punch,” a title he earned at the good old fairs that were so popular during his prime. “Harry Punch” used to have charge of an “Aunt Sally” concern at these fairs and fetes, and provided much entertainment for the public by this means and through his own abundant geniality. Mr. Langley remembered well the Crimea. He also recalled the local celebrations of the Coronation of Queen Victoria, the gifts of meat on that occasion, and the bonfires.